Philately at its finest: this upcoming stamp auction is a must for collectors and enthusiasts. 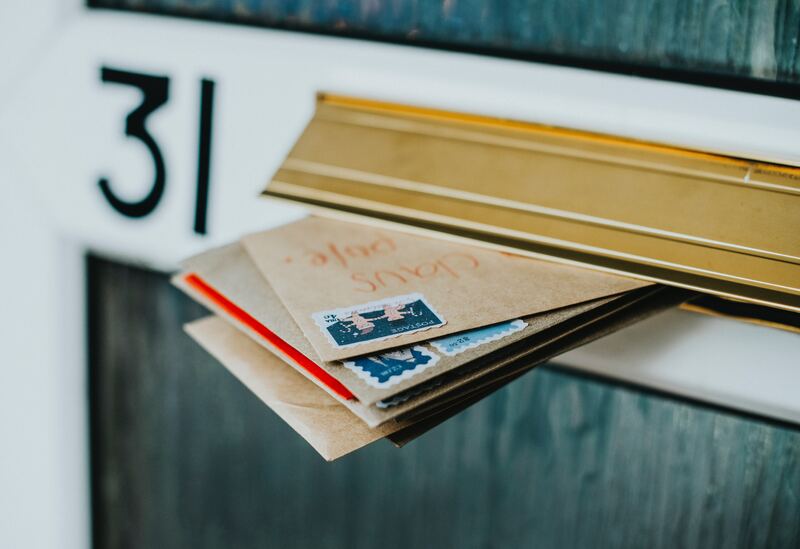 Kent-based Martello Philatelic Auctions is hosting its forthcoming sale on 22 February from 1pm, and if you consider yourself a true stamp enthusiast you won’t want to miss it. The auction has an incredible line up of quality lots, including Commonwealth albums, a coin section, and more. We’ve put together a preview below, though you’ll want to make the most of their catalogue by searching for your particular interest(s). This Commonwealth collection in GVI Crown album with case has been put together by the owner over many years. The collection includes a mixture of mint and used stamps, none of which appear to have been taken out of the album which is in very clean and good condition. 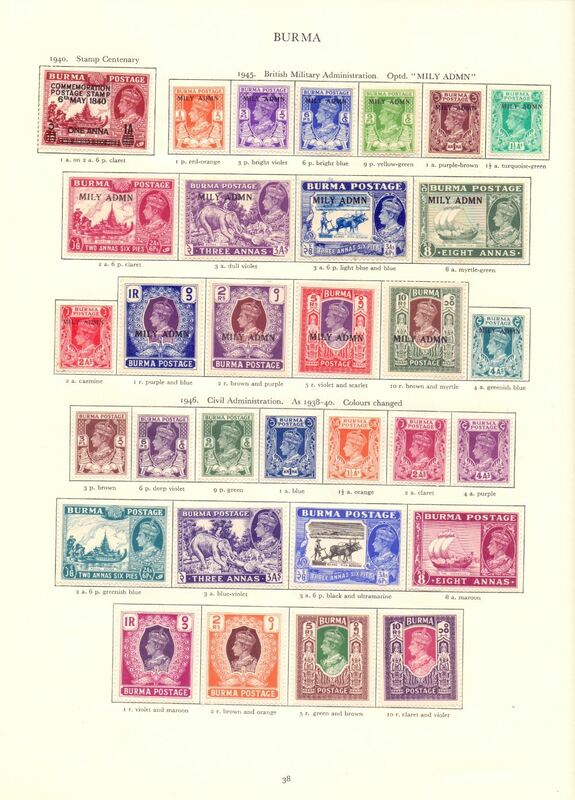 The stamps include, Ascension 1938 set to 10/- (M/M) plus perf 13 varieties; Bahamas 1938 set to 5/- (M/M); Barbados 1938 set to 5/- (M/M); Basutoland 1938 set to 10/- (M/M); Bechuanaland 1938 set to 10/- (M/M); Brunei 1947 part set to $1 (M/M); Burma 1946 set to 10r (M/M) 1946 Official set to 10r (M/M); Cayman 1938 set to 10/- (M/M); Gold Coast 1938 set to 10/- (M/M); India 1948 Gandhi set to 10r (M/M); New Guinea 1939 Air stamps to 1/- (M/M); Sarawak 1947 part set to $1 (M/M). This line engraved collection of Great Britain stamps comes in a black folder and includes 12 Penny Blacks written up by plate 1b to 11, all are 4 margin examples, though it should be noted that plate 11 has a repair and minor thin at the top of its watermark. Also included is two 1840 2d Blues both 4 margin, selection of 2d perforated star issues, written up as SG 19 to 34 (which appear to be correct). 1858 2d blues and Penny Plates to 225 (a few short perforations on 225). 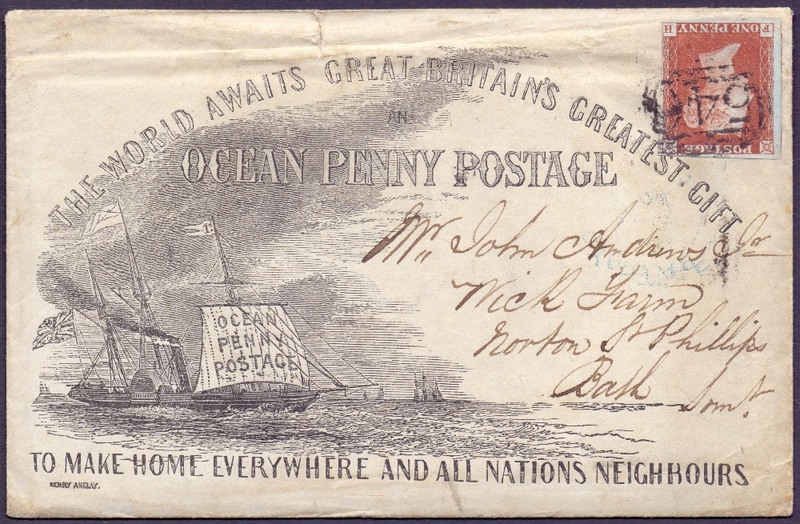 A part of Great Britain postal history, this lot is an 1851 Ocean Penny Post Charles Galpin-illustrated envelope with contents. It is a Hanley to Bath letter, franked by Penny Red. 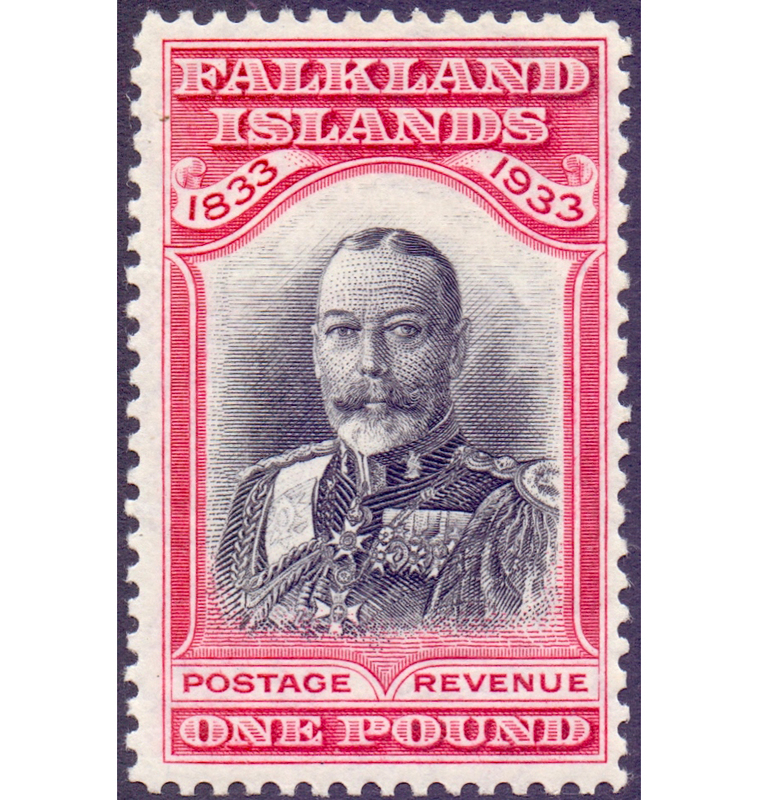 Last but not least, this Falklands stamp is a 1933 Centenary, £1 fine mounted mint with good perforations, SG 138. 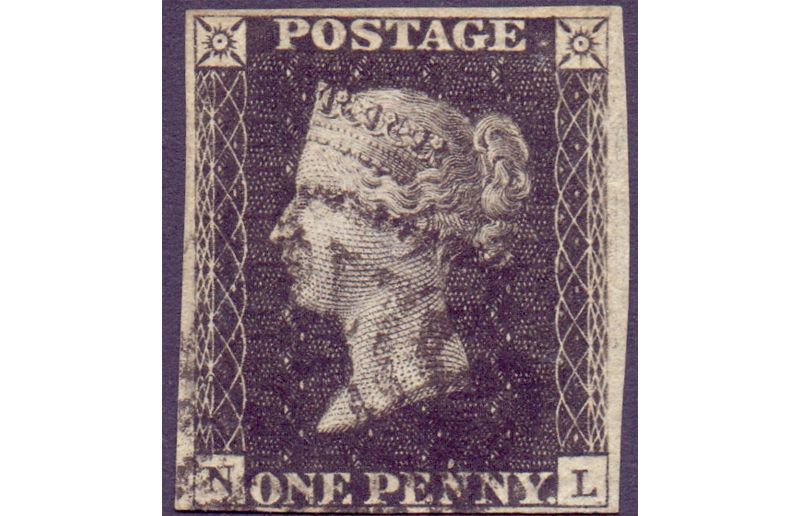 There plenty more lots – 706, in fact – up for sale from Martello Philatelic Auctions. Get in while you can!